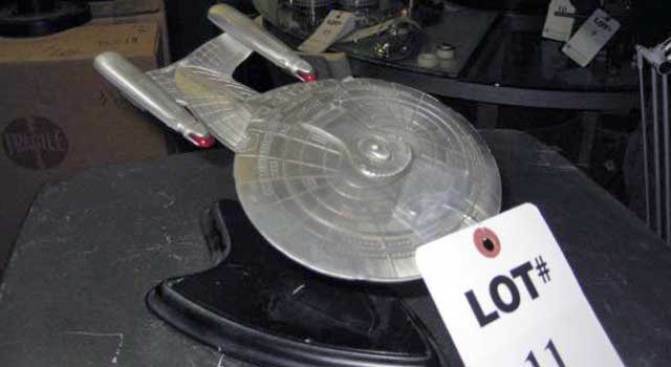 This spaceship model is among the items up for auction. It's not the ending for which Harvey Schwartz was hoping. After collecting TV and film props at his North Hollywood store for the past 40 years, Schwartz will auction off items beginning Tuesday at 9:30 a.m. Thousands of items at his 20th Century Props store are up for auction. The 120,00-square-foot warehouse includes Dr. Evil’s escape pod from "Austin Powers," furniture from "The Curious Case of Benjamin Button," helicopters from "Independence Day," and a desk actually owned by Howard Hughes, which was then used in the movie "The Aviator," along with thousands of other pieces. Schwartz said he’s been in the red for more than a year, and has lost about $2 million. 20th Century Props closes after 40 years of business and Hollywood history is up for auction. "The reason the business has been so bad for the past year is the runaway production to other states, plus the possible (Screen Actors Guild) strike," Schwartz said. "I had 28 employees last year. I’m down to six. A lot of them are still out of work."